Today, the Chancellor of the Exchequer, George Osborne delivered his eighth budget. In this article, we’ll highlight the key points that were announced. Initially, the budget started rather pessimistically, with warnings of ‘storm clouds forming over the global economy’. One of the first things to be mentioned was that growth forecasts for the UK economy will be cut for the next 5 years. 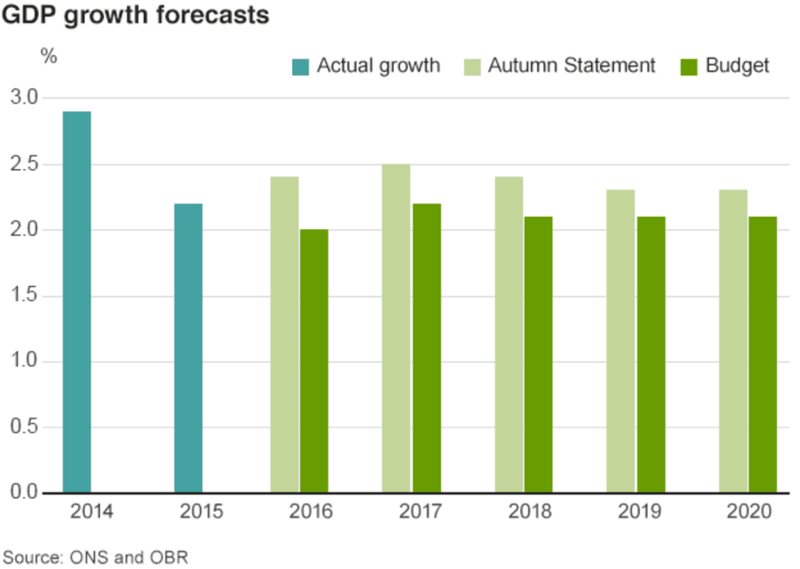 The growth forecasts for the next 5 years have been revised down significantly; the OBR had previously forecast that the economy would grow by 2.4% this year, it has now been reduced to 2.0%. Growth in the next two years has been cut by 0.3 percentage points while 2019 and 2020 are down from 2.3% to 2.1%. George Osborne attributes this failure to meet forecasts to a reduction of the levels of growth expected elsewhere in the world. Despite this, the Chancellor has claimed the UK will still grow faster than any western economy. Cuts of £3.5bn to be made by 2020. Debt to be £9bn lower in 2015-16 in cash terms. Annual borrowing in 2015-6 forecast to be £72.2bn, £1.3bn lower than forecast in November. Forecast surplus of £10 billion in 2020. Inflation forecast to be 0.7% for 2016, 1.6% for 2017, and targeted at 2% thereafter. Rumours about a sugar tax have been circulating for some time now, but now the introduction of a sugar levy has been confirmed. The notion of a levy on sugary products has proven controversial, with some branding the idea as ‘nanny statism’. On the other hand, some believe it to be a viable and practical way to tackle Britain’s growing obesity problem.The levy only applies to soft drinks, with pure fruit juice and milk being excluded. The levy will be calculated based on the levels of sugar in sweetened drinks. There will be two bands on which the levy will be based. A series of tax avoidance measures is set to raise £12bn by 2020, largely attacking disguised remuneration schemes. For the sixth year in a row, fuel duty will be frozen. During the Budget, George Osborne stated this would save the average driver £75 a year. £700m will be invested into flood defence schemes. The tax threshold at which people pay 40% tax will rise from £42,385 to £45,000 in April 2017. Tax-free personal allowance to rise to £11,500 in April 2017, with a view to reach £12,500 by 2020. Capital Gains Tax to be cut from 28% to 20%, and from 18% to 10% for basic-rate taxpayers. This applies to all capital gains, with the exception of residential properties, which will retain the original capital gains rates. 0.5% rise in insurance premium tax (aimed at funding flood defences). Class 2 National Insurance contributions will be abolished, which the government says gives a tax cut of more than £130 to three million self-employed workers from 2018. Stamp Duty Land Tax on Commercial Property – rates to move to a slice system so tax is only paid on the slice within the banding. In an attempt to support British pubs, duties will be frozen on beer, cider and whisky. Excise duties on tobacco to rise by 2% above inflation, hand-rolling tobacco to rise 5% above inflation. ISA limit increased to £20,000 from April 2016. New “lifetime” ISA for the under 40’s will enable people to save up to £4,000 a year up until they turn 50. This allows people to save for retirement or property purchases with a government contribution of £1 for every £4 subject to restrictions. The Money Advice Service, which was first formed in 2010, is set to be abolished. Corporation Tax to be cut to 17% from 1st April 2020. Public sector organisations will, on the face of it, no longer engage the services of those working through the medium of a personal service company. Small business rates relief – new threshold for small business rates to rise from £6,000 to a maximum of £15,000. The higher rate rises from £18,000 to £51,000, exempting 600,000 firms. Supplementary tax on oil and gas producers halved to 10%. Petroleum Revenue Tax done away with. Employment allowance raised to £3,000 from April 2016. Tax free allowance of £1000 for micro entities trading through eBay or Amazon. Termination payments in excess of £30,000 will be subject to employer’s Class 1 National Insurance on the excess. A new Air Ambulance Service for Northern Ireland. HS3 between Manchester and Leeds. Crossrail 2 to be commissioned. Cathedral repairs fund gets extra £20m. By 2020, all primary and secondary schools will be, or be in the process of being, an academy. Maths will be taught to pupils until they are 18. A single powerful East Anglia combined authority, headed up by an elected Mayor and almost a billion pounds of new investment. New River Crossings at Ipswich and Lowestoft.